We live in a digital age of information. At the click of a button we have access to thousands, if not millions, of resources online. But can we trust all of this information? Unfortunately, no. There has been an increase (or perhaps an explosion or pandemic) in recent years of fake news. But what is fake news? Fake news can be described as propaganda, a hoax, and/or disinformation that is purposely spread and published as real news – often using social media – with the intent to mislead for political or financial gains. Fake news will often utilize eye-catching headlines and images to increase sharing and views. The term “fake news” has evolved in recent years to become rather generic and inclusive, encompassing things that may have been considered separate categories at one time (like hoaxes, misinformation, urban legends, satire, propaganda, etc.). Fake news is nothing new. It has been around for many years. Fake news could even be traced back to the fall of the Knights Templar in the early 1300s. A 2017 NPR article explains that long before fake news, there were staged photos. Yellow journalism is a term coined in the 1890s to describe sensational news that is not well-researched but instead strives to be eye-catching to sell more newspapers. According to the Wisconsin Historical Society, tall-tale postcards emerged in the early 1900s with larger-than-life images of crops and animals, thanks to clever photography and darkroom tricks. A trip to your local grocery or convenience store’s checkout lane will reveal a plethora of tabloids containing fictional or less than reputable information, often about celebrities; and these tabloids have been in publication for many years (some of which include the National Enquirer, National Examiner, Star, Globe, and Weekly World News). If fake news is nothing new, why is it at the forefront of current issues plaguing society? One big reason is social media. Social media usage has exploded in the last several years. It has become part of everyday life. In fact, a 2018 survey from the Pew Research Center indicated that 68% of adults get their news from social media. This number is up from 49% in 2012. Social media, like Facebook, Twitter, Snapchat, Instagram, YouTube, etc., have become one stop shops for sharing content, interacting with others, and, you guessed it, getting news. Sharing content on social media has never been easier. One or two clicks is all it takes. But did you take the time to read more than just the headline before you liked, commented, or shared? Is the source reputable? Unfortunately, fake news outlets use social media to their advantage because the before mentioned questions go unanswered, it is easy for them to share things too, they are able to reach a wide audience, and their headlines or images draw people in (also referred to as clickbait). With so much information present on social media and the sharing of it, it can be easy to skim something and not realize it might be fake. People do not always take the time to fact check something before sharing or commenting. It’s safe to assume we can all agree that fake news is a problem. In fact, according to a Pew Research Center survey, 88% of adults say fake news is either causing some or great confusion about current events and basic facts. Okay, fake news is a problem; but why is it such a big deal? Well, according to the same Pew Research Center survey, about one in four adults has reported sharing fake news, whether they were aware of it at the time or not. Even journalists and politicians have been known to share or reference fake news. Fake news stories have even spiraled out of control and led to violence (like the “Pizzagate” incident). A 2018 article from The Atlantic states fake news/ misinformation has fueled the spread of certain health risks (like diseases and not receiving vaccinations). People often fall victim to fake news because they don’t fact check; the story supports their argument, position, or belief; or the amount of information available is too overwhelming. So here is the bottom line: fake news is dangerous. The ugly truth behind fake news: there is big money to be made. The money comes from advertisements. The more clicks/views received, the more ads there are (which results in more money). So when it comes to fake news, the more shocking the headline, the more potential for clicks and shares (and money of course). In 2016, a teen in Macedonia made $16,000 between August and November with his pro-Trump websites. Some examples of fake news have an agenda. They want you to get “fired up” and join their “dark side”. Some fake news is just a joke. It is meant to humor and entertain. Some stories are created with the purpose of damaging reputations. The stories that fall under this category are not necessarily false. The stories report true news, but they do so in a biased way. Certain content from Fox News, MSNBC, and others could fall under this category (Fox News, MSNBC, Huffington Post, etc. don’t have to be completely avoided, but just be aware that biases may exist). Alternatively, there is a commendable movement that calls for more precision when categorizing and talking about fake news – doing away with the simple and encompassing term that “fake news” has become. The idea is to make specific distinctions on the many different types of misleading news, which is especially important when considering how to best teach and inform how to spot these different types and how to dissect them. EAVI (European Association for Viewers Interests) has a superb infographic available online. This Beyond “Fake News” infographic breaks down misleading news into ten categories: propaganda, clickbait, sponsored content, satire and hoax, error, partisan, conspiracy theory, pseudoscience, misinformation, and bogus. Four bonus categories include: false attribution, counterfeit, misleading, and doctored content. 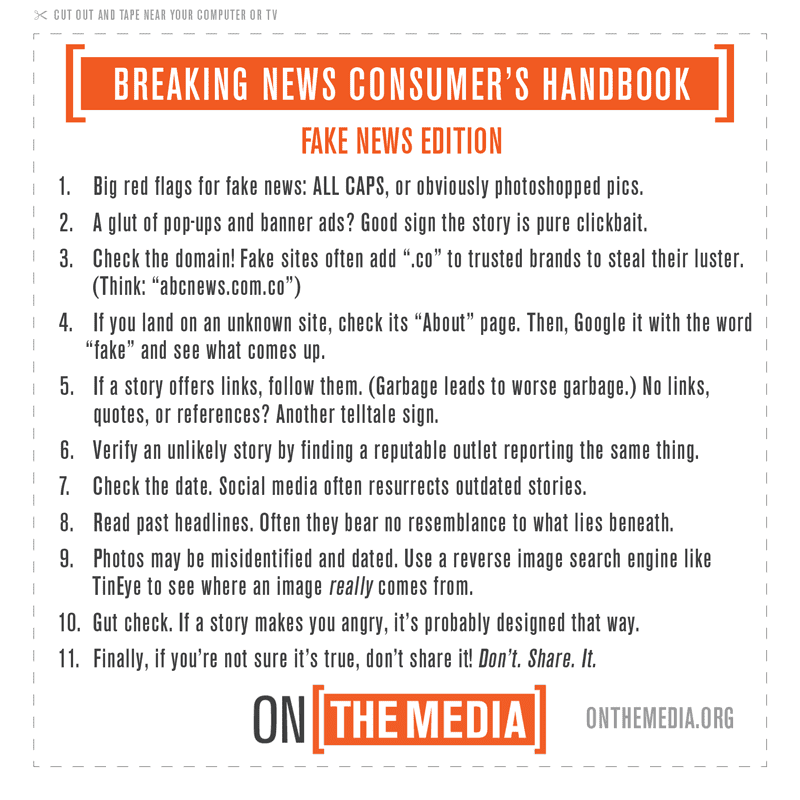 It is easy to do a couple quick checks to identify fake or real news. But when in doubt, ask the experts – like librarians! Libraries are a trusted source of information. In fact, a 2017 Pew Research Center survey listed libraries at the most trusted source of information. Utilizing librarians, library resources, and library databases is a great way of finding credible sources and information, and not to mention avoiding the possibility of running into fake news. Click here to explore the reliable databases available through the North Dakota State Library. Many libraries across the country are already working to combat the fake news problem. For example, many libraries are creating guides and resources. Many universities, colleges, and schools are adopting the CRAAP Test (Currency, Relevance, Authority, Accuracy, and Purpose). Advertisements: excessive pop-ups, banners, etc. If you’re not sure it’s true, then don’t like, share, or comment! Social media platforms are starting to fight back against fake news and misinformation. However, some critics say that these companies (like Google, Facebook, and Twitter) are doing too little, too late (even YouTube is being criticized). Twitter is cracking down on bots and fake accounts and Facebook has taken measures to combat the spread of misinformation, like updating its algorithm and News Feed, punishing groups who repeatedly spread fake news, etc. ; but the real users continue to spread misinformation (and Facebook seems to be a little preoccupied with their privacy scandals). After years of criticism for collecting ad money on fake stories (which often get more views that real stories) and helping spread fake news, the company has launched the Google News Initiative. This program is part of Google’s $300 million investment to support journalism and fight misinformation. Some platforms (like Facebook and YouTube) have decided to ban conspiracy theory content, but there are easy ways around this. YouTube now has a tool that adds fact-check links to certain videos, but this tool failed during coverage of the Notre Dame fire. So long story short, it is up to us to also take on the responsibility of preventing the spread of fake news. Before sharing, commenting, or liking, it is paramount that you read past the title of the article. Follow the steps from FactCheck.org, Harvard, and others to identify fake news and determine if there are any red flags. Put the article or source to the test and use a fact checking website (like Snopes). Use the “Report” option on social media to flag posts that are spam, harmful, or inappropriate. Click the dots or downward arrow at the upper right of the post to report it. Be responsible – Don’t try to fool people by sharing something that could be mistaken as a real story (like the person who intentionally tweeted a fake image of a shark swimming through the streets of Houston during 2017’s Hurricane Harvey). When in doubt, chicken out. If you are not sure if the article is true or the source is reliable, then don’t share, like, comment, etc. Think before you share. There is a lot of information online, and that is unlikely to change. As more things become accessible online, we have to remain vigilant of what is credible and what is not. It is up to us to be responsible enough to decipher what is real and what it fake. Take advantage of the simple advice, the easy credibility checks, and the many resources at your disposal to win the war on fake news. (For more information about these extensions, visit http://bit.ly/2V27PJZ). What is news literacy? Why is it important? Students are bombarded by news in many formats — print media, broadcast media, Internet media, and social media. The volume, velocity, and variety of information is growing exponentially. 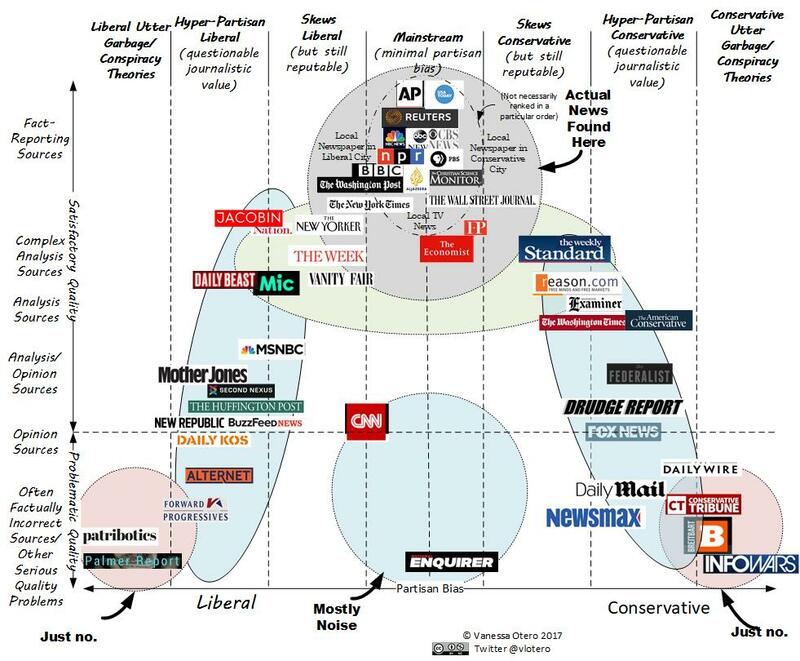 News literacy skills are essential to distinguish between fact and opinion in this ocean of data. Students must be able to determine bias or the agenda of the writer. Reading out of their comfort zone will help students see other points of view, and be more tolerant and less emotional when discussing issues. In a democratic society, informed decision-making requires that students develop news literacy skills. 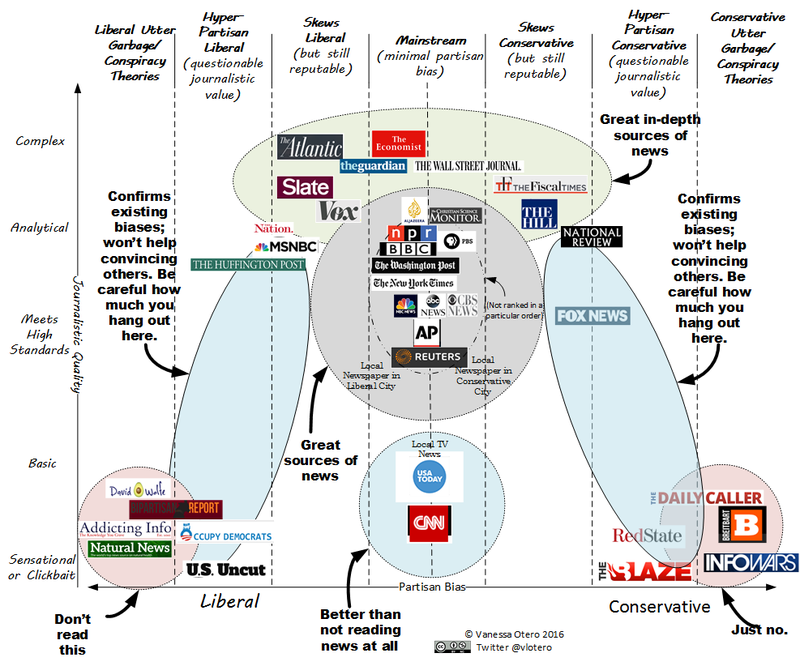 There are several online sources to help us check the validity of news stories. Here are two: FactCheck.org is a nonpartisan, nonprofit site that monitors major U.S. political players. Its goal is to “apply the best practices of both journalism and scholarship, and to increase public knowledge and understanding.” PolitiFact.com, which won the Pulitzer Prize in 2009, basically checks the facts of anyone speaking about American politics. The most outrageously false statements get the “Pants on Fire” designation. Teaching news literacy skills enables us to analyze, evaluate, compare, and critically think about the information we receive before we accept it.